Screenshot via YouTubeTina Fey yells into a cake. 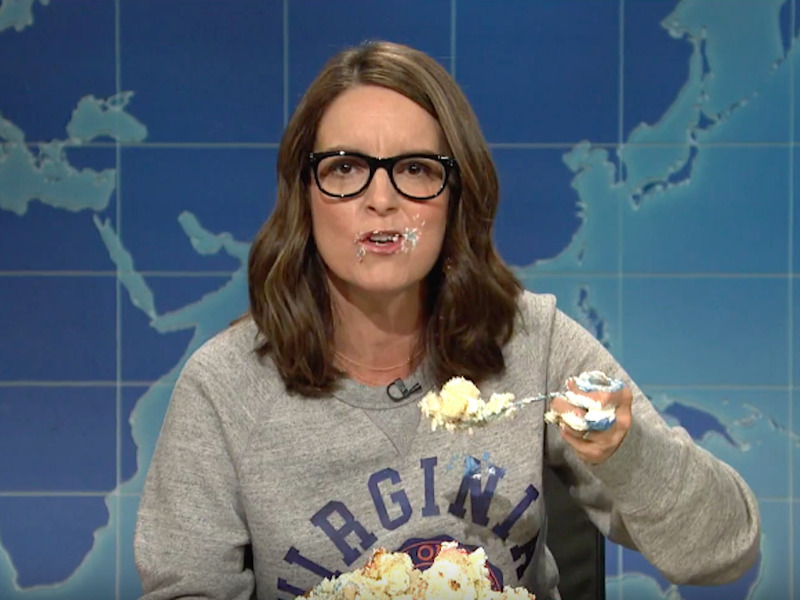 Tina Fey, a former “Saturday Night Live” Weekend Update co-anchor, returned to the studio Thursday night to offer her thoughts on President Donald Trump and the violence last weekend in Charlottesville, Virginia. Fey graduated from the University of Virginia, which is in Charlottesville, in 1992. The college town was the site of a white nationalist protest that turned deadly last Saturday. “It broke my heart to see these evil forces descend upon Charlottesville,” Fey said, appearing with current Weekend Update co-anchors Colin Jost and Michael Che. “Then next time when you see a bunch of white boys in polo shirts screaming about taking our country back and you want to scream, ‘It’s not our country, we stole it. We stole from the Native Americans. And when they have a peaceful protest at Standing Rock we shoot at them with rubber bullets, but we let you chinless turds march the streets with semi-automatic weapons,'” Fey said. “Don’t show up. Let these morons scream into the empty air,” she said.